Fractions can sometimes cause difficulty, especially when adding, subtracting, multiplying or dividing. However, fractions can also provide a boost to confidence since the concept is very relevant to most children (pizza slices for example) and, with practice, these seemingly awkward math operations can be mastered. Fractions don’t have to be always be learned and practiced using worksheets. Games are an excellent and enjoyable way for your child to learn and practice with fractions. There are 4 fraction worksheet generators below. The first provides a limitless number of questions on adding, subtracting, multiplication, and division. The range of denominators can be set (including those indicated in the new Common Core Standards For Mathematics). Common denominators can be set as can the inclusion of mixed numbers. Whole numbers can also be specified so questions such as 4 x 1/3 can be generated. The second generator provides limitless fractions to be simplified. There are 3 levels of difficulty starting with simple fractions (e.g. 1/3, 3/4) typically suitable as an introduction at 3rd Grade. The third provides conversion between mixed numbers and improper fractions (and vice-versa). Identifying Fractions e.g. What fraction of the box is shaded? You'll find printable fraction cards here. The fraction bar and charts below will be a useful aid for students. They illustrate the relationship between fractions and a whole unit and give a good representation of proportionality. The chart also include decimal fraction and percent equivalents. 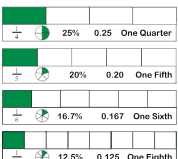 The charts below illustrate fractions using shaded fraction circles and show them written with both numbers and words. Note: The numbers and words can be hidden and the charts used as worksheets. The conversion of fractions to decimals (and back again) is a common task in math. This chart will be a useful reference tool when solving problems. These free worksheets and charts can be easily printed by selecting the Print Worksheet or Print Chart options at the top of each document or by using the Print function in your web browser. If you wish an answer sheet then check the Show Answers box and then print another copy.